Why choose a nanny over daycare? I am asked this question on a fairly regular basis: Why should I hire a nanny versus using a daycare? Ultimately the choice is yours but I can share with you many of the things I have learned over the years while being in the childcare industry. The quality of care your child will receive from a qualified, screened, seasoned caregiver is almost incomparable to the care your child will receive in a daycare setting. While many daycares strive to provide all the children under their care with individual attention, it is nearly impossible when many teachers are assigned 12 plus children. In an 8 hour day, this translates into your child receiving the equivalent of 40 minutes of focused attention. When a nanny comes to your home to be with your child, she is able to devote her entire day to your child. One of the biggest complaints I hear about daycares is the rapid spread of illness from child to child. I know families that spend a large portion of their income on doctor’s visits, prescriptions, and time away from their own work when their little ones come down with something that was being passed around at daycare. Illnesses your child contracts at daycare can adversely affect your career. When a child is sick, according to daycare rules, they cannot be taken to daycare that day, and sometimes even require an additional few days to ensure the sickness has passed. This means that either you or your significant other must stay home from work. I have spoken with parents who were on the brink of losing their jobs solely from absences due to their children’s contracted illnesses. As a two parents working family, hiring a nanny will not only reduce the number of illnesses your child contracts, but can also minimize the number of sick days you will need to use. This is also something to heavily consider when making your childcare choice. When you hire a nanny, you truly gain a better overall experience. Your child’s schedule is customized to his or her needs and wants. You can plan extracurricular activities for your child that your nanny can execute such as play dates, trips to the museum, and athletic outings. 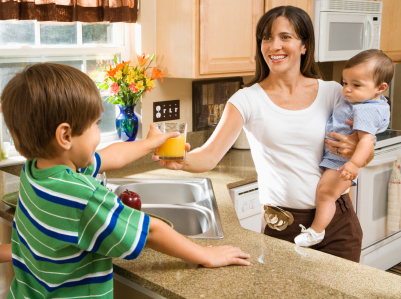 Furthermore, if you decide to hire a nanny manager, who is compensated an additional amount to assist with helping to manage the household, he or she can take some extra responsibilities off your shoulders such as laundry, grocery shopping, and additional errand running. These are all tasks that, for you, can come at the end of a long work day and take away from your time with your children. Value of outsourcing these jobs: priceless!